I eagerly anticipated the arrival of this show after first hearing about it at the Blues On Stage Calendar page (www.mnblues.com/calendar.html). Having seen deLay at a show a year and a half ago I knew what a treat was in store for anyone who was going to attend. This show was a short trip down the freeway from the Twin Cities to Mankato and the Eagle’s Club was easy to find with a little direction help from the locals. When I walked in I asked where the band would be performing and was directed to a room in the back of the club. Once in the room I realized that this was a party room -- not a bar, not a concert hall, but a big party room located at the back of the club. About 5 people were there when I arrived, and 3 of them were involved with the show in one way or another. I was able to grab the table closest to the stage and before I even got seated a couple of my harp loving buddies from the cities walked in. By 9:30 the room was not very full and it looked like I might be attending a flop so I checked to see if Paul deLay was actually playing and was assured that he was. At 10:05 the music began. Paul promised two 75 minutes sets and he definitely delivered on that promise. Those who attended were tapping their feet, bobbing their heads and groovin' to the music in very short order. By the 4th song the dance floor was packed and it appeared that this audience had come out to support Paul deLay. By now the room was getting very full and we had a blues party on our hands. Paul, with the backup band from Chicago who recorded with him on his latest CD, laid down some fine tunes. Songs from his newest CD, deLay Does Chicago, and his previous CD, Nice and Strong were featured. From chromatic to diatonic, deLay laid down grooves that most harp players only dream about. This man overflows with music. His creative lyrics, playing, singing style and technical ability sets the crossbar high for other harpists. deLay is the essence of music. His phrasing is immaculate. "From All Cried Out" to "Fourteen Dollars In The Bank" he sang and played with the emotion necessary to make his songs convincing. Blues loving people should get out to see and support this man. Harp playing ‘geeks’ who have never seen or talked to Paul should make every effort to get to one of his gigs. He was very open and honest about discussing the equipment he uses. The group I was with, and myself, talked to Paul about his equipment, especially the controls he has built into his harp case. 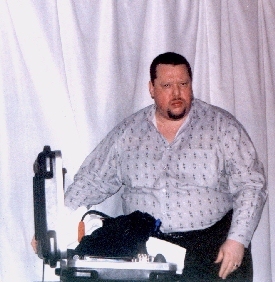 His ‘attaché’ type case sat atop a stand next to him on stage. There was a plug in on its bottom which connected to power. Other cables attached to the case connected his octave splitter and foot pedal to the sound system. A small lamp was also built into the case. Using the case Paul set up his song list, kept a brow wipin’ towel, and used the octave splitter without ever having to take it out of the case! Keeping the splitter and pedal in the case allowed him easy access to the slider controls. Of course the case also served as the home for all of Paul’s harps which consisted of ten Hohner "Big River" diatonics, four small chromatics, a big Hohner "64", and his microphone. Not trying to keep any secrets from us harp "geeks", Paul told us the brand name and model of the splitter and said, "feel free to go up and look at it." Paul’s humor, apparent in his song writing, is also present on and off the stage. With the first camera flash, just before the start of the show, he commented to one of the set up crew loudly enough for us to hear, "no photos…that show that I might be overweight." He had us thinking for a second that we would not be able to take any pictures home with us, but he was just having fun. Before and after the show he was very cordial in allowing attendees to be photographed with him and was more interested in having his picture taken in "comedic" poses rather than in normal "stand there and smile" style. Paul had played in Chicago that same morning, and he and the band drove out of Chicago around 10 AM. They arrived in Mankato in time to get a motel room, clean up, and arrive at the Eagle’s club for the show. Paul told us that he was leaving for Israel the following week to sit in with a band there. He is working hard to make himself known. If you ever hear of a performance by Paul deLay go see him. Paul is one of 6 harp players nominated on this year’s W. C. Handy ballot for "Harmonica Player of The Year" and his song "Fourteen Dollars In The Bank" is among the 5 songs nominated for "Blues Song of the Year." These nominations serve as a good indication of the great musical ability of Paul deLay. This review is copyright © 1999 by Mike Hadenfeldt and Blues On Stage, all rights reserved. Copyright © 1997-1999 Ray M. Stiles. All rights reserved. 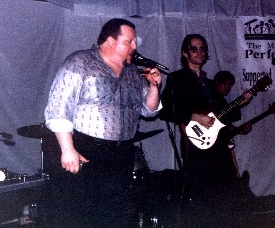 Blues On Stage is a ® Trademark of Ray Stiles.